In 2019, student loan forgiveness scams remain rampant, which seems crazy in the age of the internet, when you’d think that people would know better than to trust a random letter, email or phone call they receive out of the blue. But apparently the promise of easy, fast, or cheap debt relief is still quite a big draw, as student loan consolidations cams, student loan debt forgiveness scams, and student loan repayment scams, are certainly on the rise. All sorts of media reports have been released over the last year covering this topic, and outlining the many ways that Americans have been bilked out of millions of dollars in hard-earned cash, handing it over to scammers pretending to be helping them with their outstanding student loans. And while this is nothing short of a national tragedy, the good news is that just a little bit of education makes it relatively easy to spot the scammers, so after reading this post, you should be able to inoculate yourself from any potential scam artists, and ensure you’re not getting taken for a ride. What Sorts of Student Loan Scams Should I Watch Out For? There’s a variety of different ways that scammers could take advantage of your student loans, so it’s important that you’re aware of all the different possibilities floating around. Most of the student loan forgiveness scams you run across will fall into one of the categories listed above, and while it’s sometimes hard to tell which scam is in play, it’s often quite easy to tell that you’re being propositioned by a scammer. To help you spot these scams well in advance, here are some of the most common things that you should watch out for. If you receive a letter in the mail, an email, or a phone call from a so-called student loan debt relief company who promises to do any of things listed below, then it’s highly likely that you’re being pitched a scam. 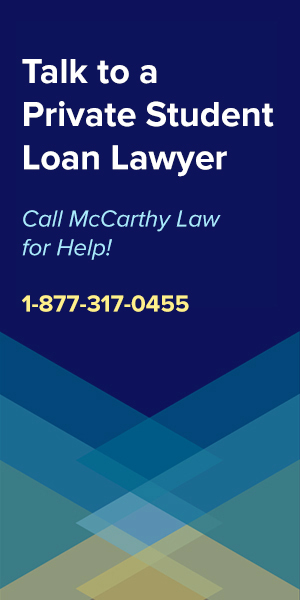 If you’re already working with a student loan debt consolidation company, debt mediation agency, debt relief agency, debt negotiation agency, etc. who is doing one or more of these things, then it’s also time to consider that you may be getting scammed. 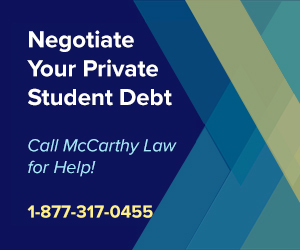 Many student loan scammers will pitch their ability to “negotiate” with your lender, and this is especially prominent in the scammers targeting people with private student loan debt. Why? Because Federal loans CANNOT be negotiated, and there is literally no negotiation involved in the process of getting a Federal student loan, or dealing with a Federal student loan, after one has been received. If you’ve got a Federal loan, and someone is claiming that they can help you negotiate a better interest rate, a better monthly payment, or a debt forgiveness settlement, then it’s time to run! If you’ve got a Private loan, and someone is claiming that they can help you negotiate a better any one of these things, that may be true, but you should know that you can handle the negotiations yourself, save the money you would have spent on the negotiator, and continue with business as usual. There’s really no reason to pay someone else to negotiate your student loans for you, unless you’re extremely timid, totally scared of your lender, or simply incapable of discussing your finances with them, and asking for a better deal. If you really cannot face the option of handling the negotiations yourself, then please don’t get scammed, and call the Student Loan Relief Helpline for assistance. This is a for-profit company that offers financial advice and assistance with student loans, and they’re the only ones in the space that I trust to take good care of my readers. Again, the only time you’d even want to consider any sort of student loan negotiations would be if you’re dealing with private loans, and especially if you’re having trouble making your monthly payments, or looking to settle the outstanding debt with a large, lump-sum payment. If that’s your situation, call the Private Student Loan Relief Helpline at: 1-866-530-9946. Make sure that you don’t pay ANYONE to help you get a Deferment on your Federal Student Loans. Why? Because you can sign up for a Federal Student Loan Deferment for free, easily, and entirely on your own. Deferments are simply a way to put your loan payments on hold, allowing you some breathing room in order to save up money, get into a better financial situation, then resume making payments on your loans. Many student loan forgiveness scammers will use Deferments as their hook to get you trapped into their never-ending cycle of additional payments, by promising to “put your payments on pause”, and charging you for the service of filling out the Federal Government’s loan deferment paperwork. Some Scammers will charge you not only for filling out the initial paperwork, but also for a monthly maintenance fee, which they’ll say is going towards their time and costs for continuing to advocate on your behalf, but which is really simply lining their pockets with your hard-earned cash. Any student loan relief agency or debt assistance company that puts your loans in Deferment status should be avoided like the plague, because there’s no benefit to simply pausing payments on your loans, especially if your loans are of the non-subsidized kind, which means that while you won’t have to make payments each month, interest will continue to accumulate throughout the Deferment period. And once that Deferment period ends, the additional interest that accumulated while your loans were paused will be capitalized, meaning added to the outstanding balance of your loan, making your payments increase, and your total debt grow. Federal student loan Deferments should only be used under very specific circumstances, like when you’ve lost your job and need to pause your loan payments until you can generate new income, or when you’ve got to funnel the money you would have been spending on student loan debt into something else more important, like life-saving medical care, a down payment for a new car, or some other essential good. 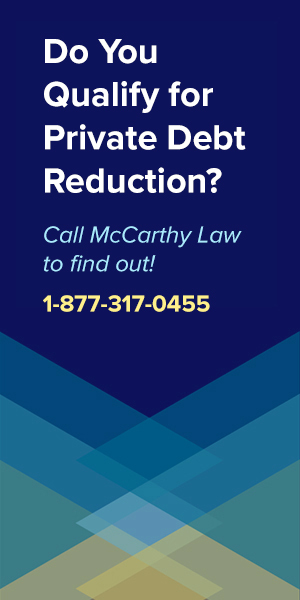 Any debt relief agency who plans on using Deferments to help you out is highly unlikely to be doing anything in your best interests, and more likely planning on scamming you out of hundreds, thousands, or even tens of thousands of dollars. Run! You’ll definitely want to avoid student loan relief agencies who plan on using Forbearances as part of their suite of tools to help you tackle your student loan debt, since like Deferments, Forbearances can also be handled entirely on your own, with no cost, and little effort. Federal Student Loan Forbearance Programs were created for similar purposes as Deferments, allowing you to put your monthly Federal student loan payments on hold for a time, giving you breathing room to get your finances back in good order before you resume making payments. And just like Deferments, Forbearances only apply to Federal student loan debt, so if anyone tries to sell you the idea of getting you a Forbearance on your private loans, then it’s time to hit the bricks, because they’re either a scammer, or clueless. Don’t let these individuals take advantage of you; if they pitch the option of getting you a Forbearance as being a core component of their debt relief plan, then you can be relatively sure that they’re not operating in your best interest, but are simply trying to string you along. There is no path to “instant” or “immediate” loan forgiveness, as everything involved in getting your student loans forgiven takes a great deal of time and effort. Perhaps the fastest way to get complete loan forgiveness is simply to die, as death definitely wipes out your outstanding student loan debt. 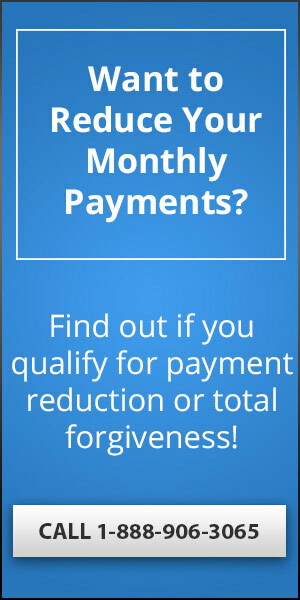 The second fastest way to total loan forgiveness would be to become totally and permanent disabled, as the Total and Permanent Disability Discharge Program offers 100% forgiveness for any outstanding Federal Student Loans, and does so in an instant, as soon as you can prove that you qualify for the benefit. However, outside of those two niche opportunities, there are no other ways to receive complete Federal student loan forgiveness without going through some kind of complicated process (like the Public Service Loan Forgiveness Program, still the best Federal Student Loan Forgiveness Program currently on offer). 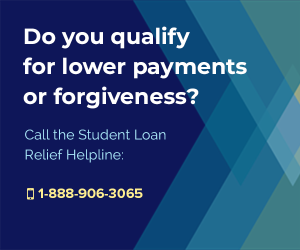 PSLF takes at least 10 years to receive loan forgiveness, so no one should be calling that an “instant” or “immediate” fix to your outstanding student loans. And other discharge programs, even very powerful ones, like the Closed School Loan Discharge Program, the Borrower’s Defense Against Repayment Discharge Program, or a Student Loan Bankruptcy Discharge, are also complicated, messy, legal processes that requires tons of paperwork, and perhaps months or even years of processing. Accordingly, any debt relief agency or credit counselor who starts talking about getting your loans immediately and entirely forgiven should probably be viewed with a healthy amount of suspicion. Personally, I wouldn’t trust anyone who claims they can immediately wipe out my loans, as the odds of that actually occurring are extremely unlikely. Like the promise of “instant” loan forgiveness, the removal of “100%” of your debt sounds great, but it isn’t quite as simple as many of these scammers would like you to believe it to be. Yes, it’s possible to get 100% of your student loans, both Federal or Private, discharged, via processes like filing for Bankruptcy, completing a Public Service contract, generating forgiveness benefits via one of the excellent Military Student Loan Forgiveness Programs, or by completing some other similar process, but typically “100%” of your loans won’t be forgiven. What’s far more likely to happen is that you’ll have some percentage of your debt drawn down, either getting it forgiven due to negotiations that went well with a private lender, or because you earned a financial relief benefit by qualifying for one of the many Federal Student Loan Relief Programs on offer. Any agency or debt relief counselor who says that they’ll be able to eliminate 100% of your outstanding loans needs to clarify that statement to explain exactly what they mean. It’s far more likely that they’ll follow up with something like “up to 100% of your loans”, as that’s far more likely to be the reality of the situation. Finally, even if one of these agencies is capable of helping you qualify for having some portion of your loans forgiven, you’ll want to make sure that you ask about tax liabilities or tax implications well in advance of the date that your loan is dropped, since it’s totally possible to end up trading your outstanding student loan debt for outstanding IRS tax debt, which is a situation you definitely don’t want to find yourself in. First, let’s be entirely clear about one thing: there is no debt “settlement” process for outstanding Federal student loans. Whatever you owe is what you owe, and unless you qualify for some kind of forgiveness benefit, you’re going to have to pay back the full amount of whatever it is you owe to the Federal Government, at some point in time. And on the Private student loan debt side, the Settlement process is similar to the Negotiations point I made earlier in this post; any Settlement that one of the debt relief agencies makes for you could have been made on your own, without the added time and cost that had to be spent finding an agency to do the work for you, then paying them to do it. If you’re truly looking to settle up with your lender, paying off the debt either entirely, or in part, then what you should do is contact them directly to discuss your options and opportunities, rather than letting some third-party deal with it all for you. Again, just like I mentioned with “Negotiations”, you’re fully capable, legally able to, and encouraged by prominent debt experts and consumer advocacy groups to attempt to “settle” your student loans with the lender entirely on your own. There’s nothing an agency or third party can do for you that you wouldn’t be able to do yourself. And the truth of the matter is that you’re likely to be able to negotiate a better Settlement than any debt relief agency could for you, since you’re cutting out the expenses of paying off the middle man for their assistance with the process. If you get asked to “pay us first”, or if you’re asked to pay this new entity first, so that they can then send your payments over to your original lender, then it’s highly likely that you’re being scammed. The reality is that any organization who is actually looking out for your best interests isn’t going to require that you pay them first, and they’ll also tell you to go ahead and keep on making direct payments to whoever is servicing your loans as well. Any company that tries to get you to pay them first, so they can then make payments on your behalf, should be avoided like the plague, as this is not how standard debt consolidators and debt relief agencies should operate, at all. This is one of the most important indicators that shows you’re being scammed, because it’s simply not the way businesses should run, and it’s definitely the way that scammers attempt to operate, since they can take your money without sending anything along to your actual lender, and disappear. As soon as you hear something like “Pay us, so we can pay on your behalf”, it’s time to hang up the phone, or stop responding to those emails. There’s a good chance you’re talking to a scammer. If you get asked to provide “power of attorney”, so that the student loan debt company can handle all your loan issues entirely on your behalf, without even having to get your consent, then you can almost certainly be assured that you’re dealing with some sort of scam artist. There’s really no reason why any debt relief organization (student loans or otherwise), should need power of attorney, because that means they will have complete and total control over everything related to your loans. If you give someone power of attorney, the’re going to be able to do whatever you would be able to do, and that’s a dangerous thought knowing how many scammers are out and abut these days. Don’t be fooled either, because some firms have wizened up to the lingo, and now instead of asking for “power of attorney”; they’ll ask you to give them “third-party authorization”, which is essentially the exact same thing, and just as dangerous. As soon as you get asked to provide power of attorney, it’s time to start considering whoever is requesting that as being a student loan debt scammer. NO legitimate debt relief agency would tell you to stop making payments to your lender, student loan servicing company, or anyone else that you still owe money to. You can rest assured that ANY reliable organization would have you continue making payments not just up until the point that the two entities are communicating with each other and attempting to find a resolution to your problem, but ever, period. The only time you’d ever want to even considering stopping making payments to a student loan debt lender is after you’ve received an official approval letter from the Department of Education, or from the student loan servicing company who’s responsible for processing your monthly payments. If you aren’t being told directly by DOE or your servicer to stop issuing payments, then it’s vital that you continue making them, because all it takes to Default on a Private Student Loan is a single missed payment, and you definitely don’t want to go into default. Real debt relief organizations do not require that you pay them an application fee to review your account and determine what they can do to help deal with your debt. If you’re being told that you need to pay some sort of application fee, or review fee, to get started on working toward debt relief, then it’s almost assured that you’re speaking with the student loan scammer, and that you need to start looking elsewhere for assistance. There is no reason, at all, whatsoever, for a company to charge you money without promising to deliver a specific service. I’ve even received horror stories from readers who spend hundreds or thousands of dollars on these so-called “Application Fees”, only to be told that they’re not eligible for any assistance from the company. Why does that happen? Because the companies aren’t legitimate! They’re claiming that they’ll perform the review, then prepare to get some work done on their behalf, but the reality is that they’re just trying to collect as much cash from you as possible before abandoning you and hoping that you give up on pursuing them for a refund. The Department of Education is very unlikely to contact you regarding your student loans, especially out of the blue, and they’re almost certainly never going to contact you, asking directly for payments or other details. However, there are all sorts of scammers out there who call you up, claiming to be working hand-in-hand with the Department of Education, and needing to collect information, or payments from you. Don’t listen to these people! Anything who claims to be working with, for, or even at the Department of Education is probably a scammer. This is very similar to the popular IRS Tax Scams we’ve all heard about (or even run into), where people call you up, claiming to be from the IRS, and demanding to collect some money from you immediately in order for you to avoid jail time or some other major additional penalty or fee. Do not fall for this trick! The Department of Education is NOT going to call you. If they need to get in touch with you, they’d send a letter, on official letterhead, and it’d be obvious that it came from them instead of some two-bit scam artist. Unfortunately, it’s become quite common to receive letters in the mail, voicemails on your phone, and emails in your inbox, from groups marketing their student loan debt expertise, and claiming to be capable of getting rid of your debt, or at least reducing it. The problem is that many of these groups are not legitimate organizations, but scam artists pretending to be good debt relief companies. How do I know that? Because any company that sends you a letter, email, or voicemail, without having had any prior contact with them first, is probably not a company that you want to deal with. Why? Because legitimate businesses are busy handling their actual work and operations. They aren’t doing things using robocalls, autodialers, or purchased email lists to seek out potential clients. Legitimate student loan debt relief companies get enough phone calls, emails, and referrals from happy customers that they don’t need to spend all their time marketing their service, while scammers have all sorts of free time to come up with new tricks to bilk you out of your hard-earned cash. If someone contacts you, especially out the blue, trying to convince you that they can handle your student loan debt for you, then it’s probably not a good idea to believe anything else they say. Why? Because first, anything they promise to do for you, you can do for yourself, but also because the legitimate credit repair and student loan relief agencies aren’t out there prospecting for new clients, since they’re busy servicing existing ones! If you’re going to outsource any of the work related to your student loan debt, then don’t give it to someone who contacts you, but instead conduct your own search to find a company that does exactly what you want done, at the price you want to pay. Once again, I would recommend considering the Student Loan Helpline, as I trust them to get the job done right every time, and to provide real value to my readers. How Can I Avoid the Scammers? That’s simple – just watch for the tell-tale red flags above, but also make sure to move slowly if you do decide to work with a student loan debt relief agency. Don’t sign up for anything right away, and take a few minutes of time to perform a Yelp or Google search to look for reviews from other people dealing with the companies that you’re considering using. In some cases, you may be able to quickly find horror stories about people being scammed out of hundreds, thousands, or even tens of thousands of dollars by unscrupulous student loan debt relief companies who claim to be looking out for them, but who are actually just milking them out of as much money as they can get their grubby little hands on. Fortunately, if you’ve got some time and you’re willing to dedicate that time to figuring stuff out on your own, you should keep in mind that dealing with your student loans is much easier than it’s ever been before, and that it’s quite possible to avoid any sort of debt relief scam by simply handling your student loans entirely on your own. In fact, there are only a few times when I’d recommend paying anyone for help with your student loans at all. My advice is that most student loan borrowers will never need anyone else’s assistance in handling their outstanding debt, unless they fall into a couple really specific need areas, where it becomes beneficial to outsource the work to an expert. 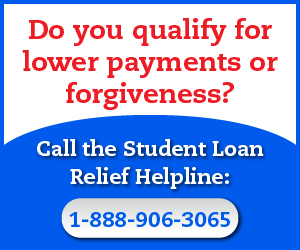 When Should You Hire a Student Loan Relief Expert? Note that all three of the situations above clearly state: “If you have money”, because that’s the most important factor in deciding whether to deal with your loans yourself, or paying someone else to take care of them for you. Personally, I spend hours each week investigating the industry, reading up on the different benefits programs available and making sure that I understand the nuances of each of these programs, but that’s only because I run this website, and I need to know these things! Ordinary Americans typically don’t have the time, nor the inclination, to spend several hours a week reading and researching student loans, student loan laws, and changes to the many different student loan programs. If you’re one of those people who simply doesn’t want to be bothered with managing your student loan debt, then I don’t blame you, because even if it isn’t all that complicated, it’s still a chore! If You Do Choose to Outsource, Be VERY Careful! Let’s say you fall into one of the categories I outlined above, and you want to hire an expert to help deal with your student loans; how should you go about finding the right company or person to handle your debt? While a lot of things in this industry aren’t easy to answer, I can tell you with 100% honesty that this is one of the most common questions I receive, and one that’s extremely easy for me to answer as well. 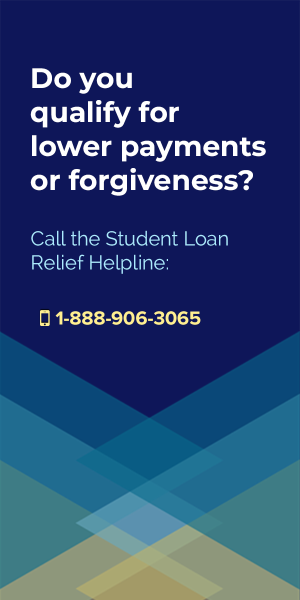 My favorite student loan debt relief company is called the Student Loan Relief Helpline, and I like them for a few very specific reasons, but primarily because I know they’ve produced positive results for so many of my readers in the past. 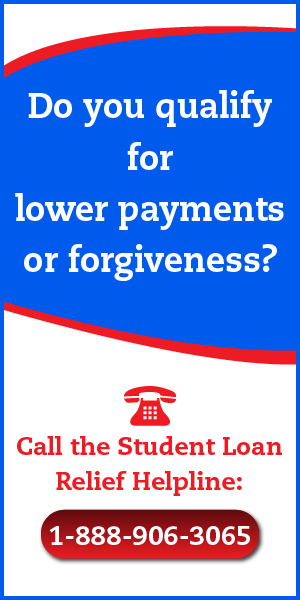 What Do I Like About the Student Loan Relief Helpline? 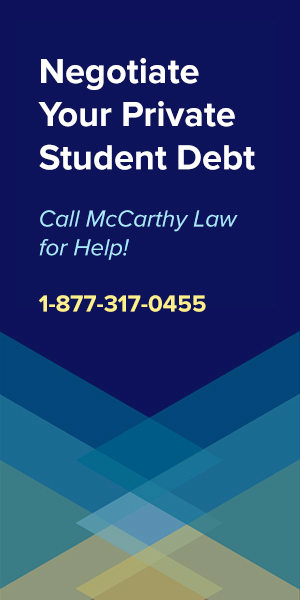 The first thing I really like about the Student Loan Relief Helpline is that they’re divided into two distinct companies, with one handling Federal Student Loans, and the other handling Private Student Loans. This ensures that the person you talk to (and potentially work with) is an absolute expert in their field, and that they’re far more likely to be aware of all the special factors involved in dealing with your student loans, whether they’re public or private. There’s a HUGE difference in the options available for Federal student loan borrowers and Private student loan borrowers (just check out my respective Federal Student Loan Forgiveness and Private Student Loan Forgiveness pages to see the vastly better offers for Federal borrowers! ), so it’s very, very important that you speak with an actual expert who’s well-versed in handling your type of loans. The second thing I absolutely love about the Student Loan Relief Helpline is that they actually know what they’re talking about, and they won’t string you along. Some of these student loan debt resolution agencies are staffed by people who have literally no ethics, no moral compass, and no qualms about completely screwing you over. Some of them don’t even have any idea what they’re doing, other than trying to pitch you services you don’t need. 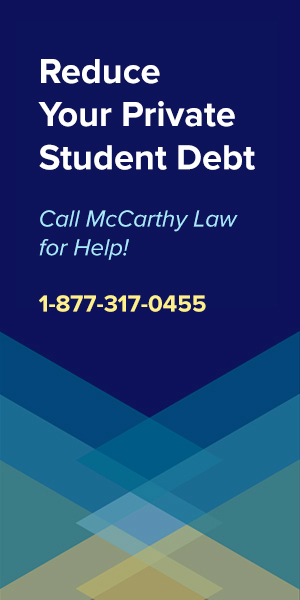 I have NEVER received a single complaint about the Student Loan Relief Helpline from ANY of my readers, which makes me quite confidant that everyone over there does a good job of providing not just high-quality customer service, but also a high-quality end result; saving people more money than they spend! And that is the way to measure the performance of a debt resolution agency, because it’s not just about them getting rid of your loans, it’s about them getting rid of your loans for significantly less money that you’d have to pay if you did it all yourself. 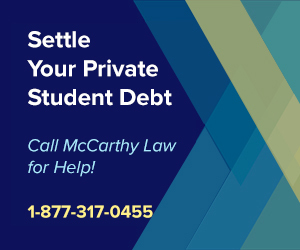 It’s not all that hard to avoid student loan relief scams, as long as you keep your wits about you and are willing to do some research on any potential debt relief company you’re considering. If you follow this process, you can pretty much rest assured that any scammers will be weeded out of your consideration, and that you’ll be working with a reliable agency that offers actual assistance for your student loans. What If You’re Being Scammed Now??? Contact the Credit Bureaus – This should be your first step, as you need to make them aware of the scam and explain exactly what occurred in order to prevent your credit from being destroyed. Tell the Bureaus that you want to report a possible fraud, and that you need your credit freezed until you can sort it all out. They’ll be happy to help you with this. Contact Your Loan Servicer – Call whoever services your student loan debt and tell them that you fell for a student loan debt relief scam, explaining all the same details you told the Credit Bureaus. This is the part of the process that isn’t much fun, as you’ll have to tell the same story over and over again, but your Loan Servicer definitely needs to hear the details so they can react to the scam and protect you from any further problems. If you gave the scammers Power of Attorney, then make sure that you tell the Loan Servicer to remove that so you can regain control of your account. Contact Your Bank and Your Credit Card Company – Tell your same story again, asking if you can stop payments for any checks or credit card authorizations that were setup with the student loan scammers. Ask if you can report the transactions that already went through as fraudulent, which may allow you to get refunds for any money spent with the scammers. This should work if you’ve been using credit cards, but may not if you were using a debit card. and ensure that the scammer won’t be able to access your account any longer. Make sure to use a very strong password, as you know they’ve got your FSA ID#, and you definitely don’t want them being able to crack the password via brute force. File a Complaint with the Consumer Financial Protection Bureau – Report the student loan scammers to the CFPB so that they can pursue them and hopefully prevent others from being scammed. You can use the CFPB’s “Report a Complaint” Website, or call them at (855) 411-2372.
the more likely they’ll be to stop these scammers from getting money from other people, and the more likely you’ll be to recover any money you lost to the debt relief scam. Use the FTC Complaint Assistant Website to file your scam report. File a Complaint with Your State Attorney General – There’s a very good chance that your state’s Attorney General will pursue any scams reported to them (they’re all about preventing fraud, especially financial fraud), so you’ll definitely want to contact them to alert them to the student loan scam you’ve encountered so they can stop the scammers from doing it again, and perhaps help you recover any funds you spent with the scammers. Once you’ve done all these things, you can take a bit of a break, knowing that you’ve gotten all the financial institutions and government agencies needed on the case. There’s a pretty good chance that your information will prevent the student loan forgiveness scams from being repeated in the future, but also that you’ll be able to recover some of the money you lost to the scam in the first place, so I definitely recommend following each of these steps and providing as much detail to each agency or organization as possible. If you’ve got any other questions about student loan forgiveness scams, or anything else related to student loan debt, then feel free to ask them in the Comments section below. I typically review Comments every morning, so I’ll try to get you a response in 24 hours or less. Thanks for visiting my site, and if you found this information to be useful, then please consider sharing a link to my site with your friends, family members, and social media followers. The more people who visit this place, the more time I can spend producing content like this that helps people better understand how to deal with their student loans. Wow, this is an awesome resource! Thank you for all of your hard work and research. I subscribed to your newsletter and bookmarked this page for future reference. Thanks for the kind words Jenna! Where can I find this application to get my loans resolved from this fraudulent college? Danny, visit my page on the Borrower’s Defense Against Repayment Program. You got it Hannah! Hope this helped!